Are these likely soulmates? or normal synastry? Hi There! I'm new here and still trying to figure out the site. I'm trying to figure out our compatibility, i felt very strong energy from first meeting, which I coulndn't explain what it really was.. and later found out a possible double whammy? What can you make out of this compatibility? Thanks so much! hey clammary, would you be able to post graphical charts aswell? Just looked at the chart clammary and it says zero latitude and longitude. Did you enter a location when making the chart? The pair of you have suns in opposite signs and Moon in water signs, so it is a good start; but there are no sun/moon aspects. Mercury/Mercury opposition, good for debates and conversation, disagreements possible. Venus/Uranus opposition, this could be the energy you felt instantly. Possible seesaw between feelings of hot and cold. Maybe an unusual friendship/relationship. 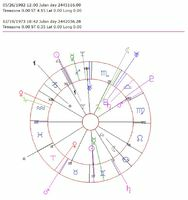 Sun/Venus trine Double whammy, as stated; this is very nice for compatibility. What is this person to you? Family member, friend, lover? Also, if you know the birth date of the other person (I assume you don't know their birth time) then more analysis can be done. HI, thanks for that! sorry wasnn't able to log in for a while.. i forgot my pw. I'm interested in this person romantically.. I'll enter another graphical chart..chart I dont know his birth time. Is the venus conjuct mars a good thing? could it be felt by both person? 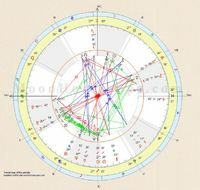 any input would be appreciated about this synastry.. if its likely a good match or not. I can't read the charts.. any explanation would be appreciated. thanks! 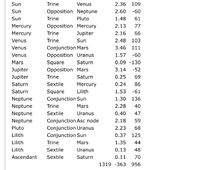 also, is there any sort of way to know the aspects ( planet positions ) on the day we met? if that day had anything to do with our meeting. No worries clammary, I'll take a look now. Yes, if you remember the day, time and location of when you first met, we can look at that too. By the way clammary, your natal data has changed again. In the first chart, you had a Scorpio moon at 2 degrees. Now you have a Libra moon at 27 degrees. Please clarify your birth data. Sun/Venus DW, pleasant aroud each other, you enjoy each others presence. Your mercury opposite his mercury, sextile saturn. Good debates, possible arguments, but learn from each other. your Mars conjunct his Venus, perhaps you like to take the lead. you find him attractive. your Mars is also trine his Neptune, so maybe you find him dreamy and sensitive. your Saturn square his Mars, perhaps he sometimes find you stifling/critical. your Chiron opposite his Saturn sextile his mercury, there is a Mercury/Saturn influence here. How did you meet if you don't mind me asking? Through emails, text messages online or at schools, libraries, or through business? your Uranus opposite his Venus, did you meet him suddenly or by chance? I avoided looking at your Moon positions until you tell me the correct information.